For $7,500, Is This The World’s Nicest TR7, And Does That Matter? Today’s Nice Price or Crack Pipe Triumph is probably one of the best condition TR7 coupes you could find. That’s likely due to it having only 15,000 miles, but begs the question does that make it worth fifty cents for each of those miles? British steel is not just a great Judas Priest album, it’s also what makes up yesterday’s custom 2005 Mini Cooper pickup. Sadly for its seller, that car’s British steel - and plastic, lots and lots of plastic - was offered for what 54% of you considered to be too much American copper. Maybe a Red Bull would perk him up? Today, same price, different car, more British steel! Once advertised as the Shape of Things to Come the doorstop-like TR7’s lineage may be traced back to the TR2’s 1953 debut at Earl's Court. That original car was a reaction to MG's success in the North American market, and followed Triumph Motor's failed attempt to wrestle the Morgan Motor Company from Henry Frederick Stanley. In a funny bit of coincidence, Morgan is still standing today while Triumph is long dead, some say due to patricide committed by the TR7. Actually, there is practically nothing the 7 has in common with its alphanumeric forebears, a fact made plain in the examination of this 1976 example. If one were doing a school paper on the collapse of the British motor industry, and needed an example of one of the prime actors of the event, this 15,000-mile TR7 might be a perfect choice. The car presents almost as new, with rubber that appears un-marred, white paint that still maintains some luster, and even a factory coach line that hasn’t faded like the British Empire. Of course even TR7s coming straight off the Liverpool assembly line had something enfeebling about them, so a good test drive of this one might be in order. That drive would likely point out the car's surprisingly decent handling, as well as the challenges the 92-horse 1,998-cc four has in moving the car’s 2,200 pounds. Following the TR6 with its torque of the town two and a half litre six, the Dolomite-sourced four of the TR7 was and is a bit of a frump. At least this car has a four speed stick which will give you something to do during those interminable double digit runs to freeway speed. The interior here is as nice as the exterior, although it’s hard to tell from the pics whether the car came originally with beige carpet, or black that has faded over time. The plasticky dash - which again stands in stark contrast to the lovely wood of its predecessor - seems in excellent shape, and the stock steering wheel, with its massive center section, is intact. Time magazine - noted authority on automobiles - once calumniated the TR7 as one of history’s worst. That smear was based on the car’s reputation for fragility, something to which this particular 7 serves as antithesis. If you happen to be an anglophile - and no that doesn’t mean you have an unhealthy attraction to British kids - or have always felt the TR7 got a bad rap, then maybe this is the perfect opportunity to grab a wedge of TR pie. 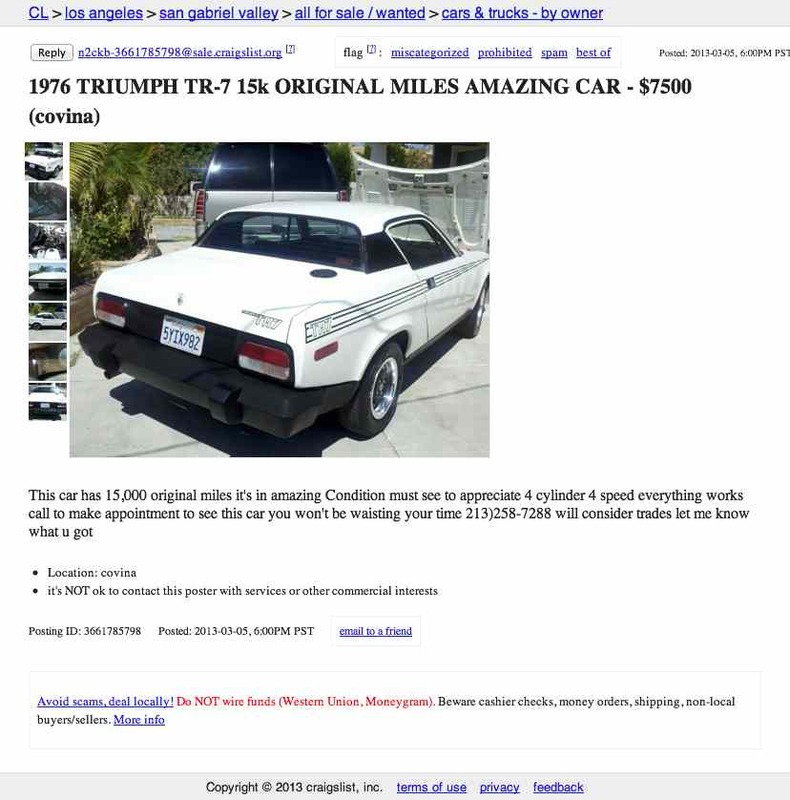 Of course, you’d first have to get past its $7,500 asking price, which is damn-near double what the car commanded new. For that price you’d be getting a car that looks and probably drives almost like new, so perhaps it’s worth paying a little more up front. But, is it worth paying that much more? The TR7 FHC is the least desirable of the TR7/8 models, and even dropheads can be had for less than this, albeit not ones in this sort of shape. Is being so nice worth the extra cheddar? 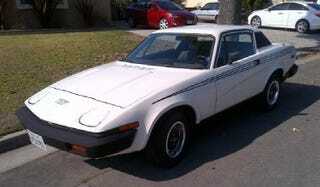 What do you think, is this ultra-low mileage TR7 worth $7,500? Or, is that asking price also asking for trouble?